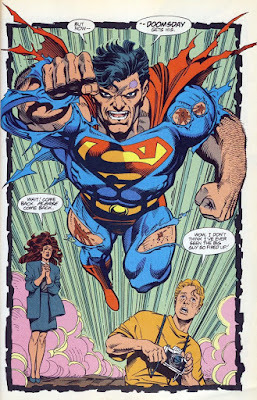 As I’ve mentioned in previous posts, Mike Barr, the series writer, and I were working “Marvel Style”, starting with this issue. (“Marvel Style” is a method of collaboration between the writer and penciller innovated by Stan Lee in the mid-60’s where he would give the artist a plot outline, allowing the artist to break the story down in terms of the number of panels per page, and what would happen in each panel. 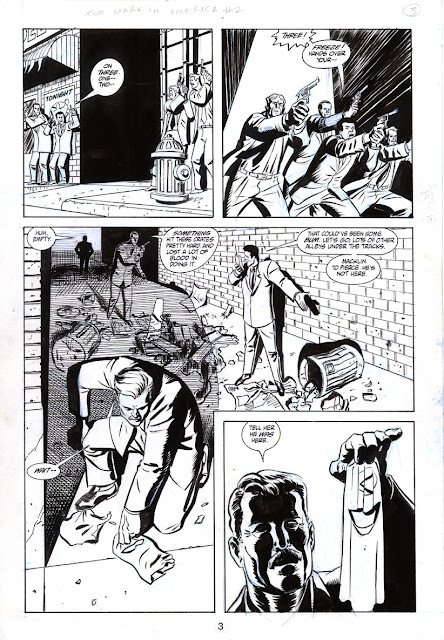 Stan would write the dialogue and captions based off the artist’s layout, sometimes demanding changes in the pencils before sending them to the inker; sometimes he would demand changes in the ink stage, which is why one can find glaring and obtrusive panels obviously drawn by John Romita Sr. or Marie Severin in the middle of other artists stories.) Especially on this page; Mike’s outlined the events of the page, implying that it should play out in six panels. 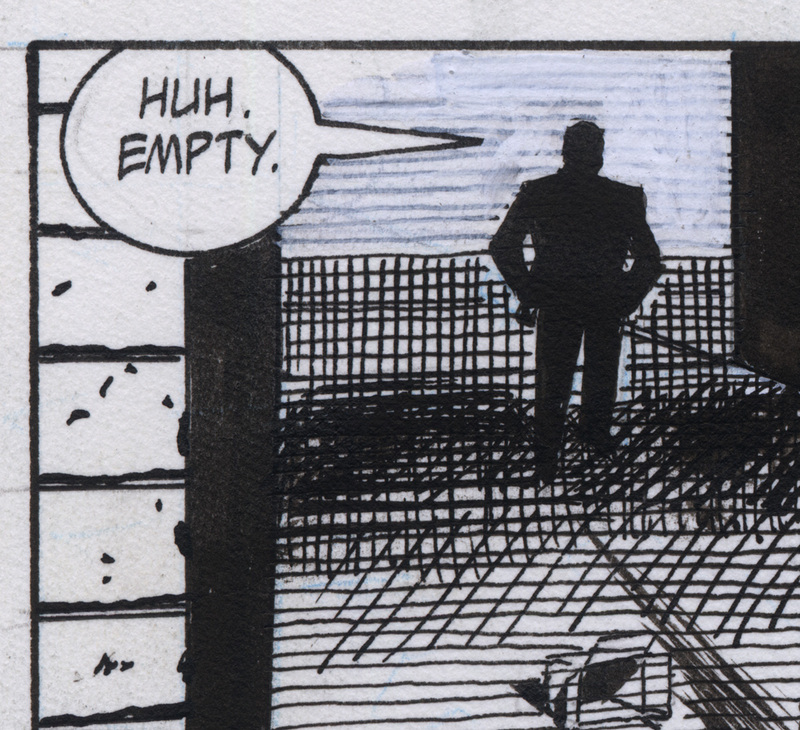 I, on the other hand, was going through a “long take” phase, having recently seen “Rope” and “Under Capricorn” directed by Alfred Hitchcock, and that affected my layouts in several places in this mini-series which I’ll point out along the way. 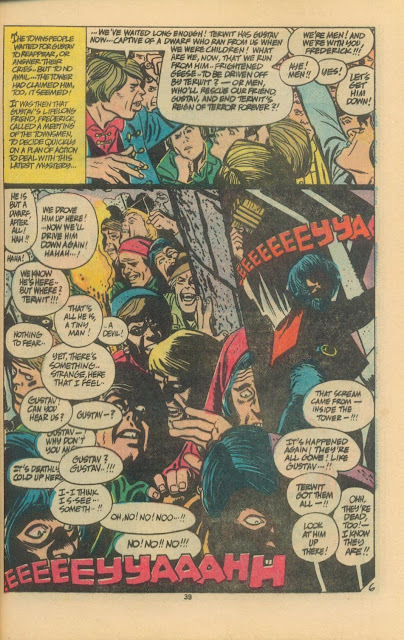 You can see it here in panel three, where four action beats are combined into one panel, organized by the direction of the reader’s “eye read”, left to right, up to down. I was and am quite proud of this; I think the whole page flows remarkably well. My other key influence on this page was Alex Toth, specifically his story, “Eternal Hour” from “Witching Hour” #1. 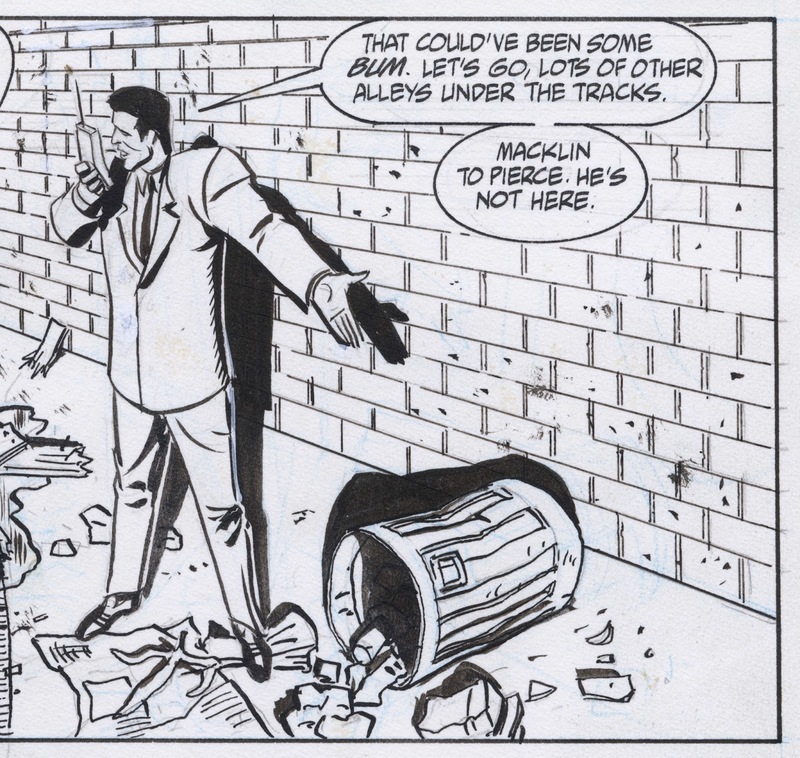 During my summer vacation in 1986, I had copied this story in my sketchbook to study Toth’s spotting of blacks and had my mind blown by this panel. 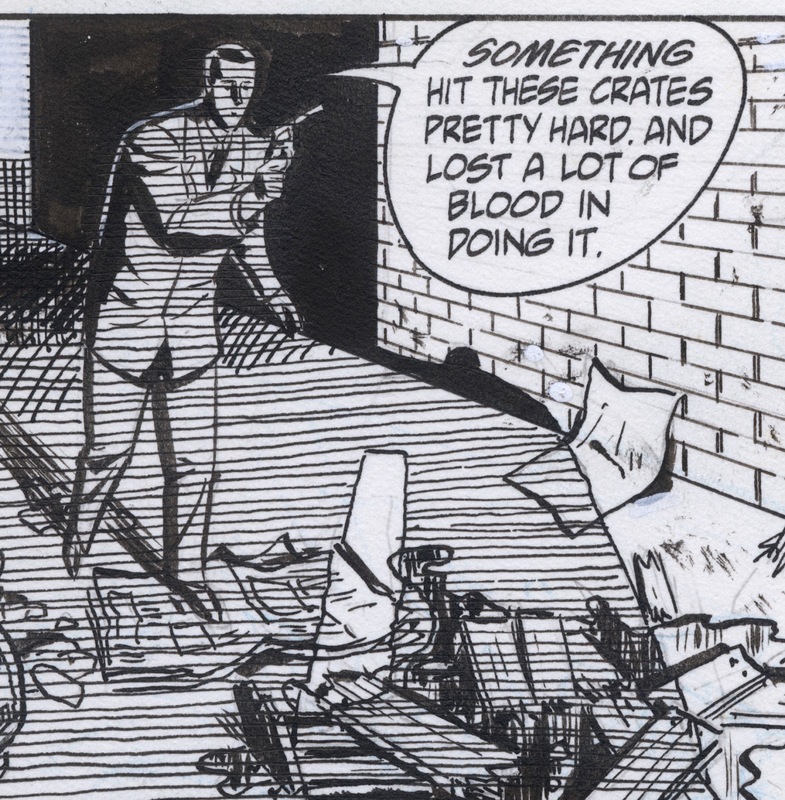 You see, I had been working professionally as a TV animation storyboard artist for 3 years by this point, and had been trained to see comics in a storyboard sense, i.e., each panel was a single moment or action. 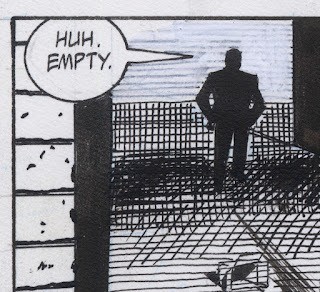 This panel is basically 3 moments, organized by eye-read, left to right, and, most importantly in this case, up to down. My youthful mind was blown, new vistas opened up in an instant. I can only compare it to the climax of “The Miracle Worker”, when Helen Keller finally figures out that all those weird hand gestures Anne Sullivan has been making means “Water”. 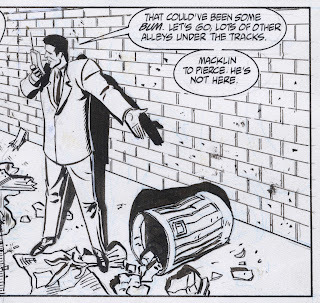 During one of my phone chats with Toth during 1993 (when I was drawing “The Mark”, I asked him about this specific panel; he had no specific memory of it, wouldn’t even tell me if he wrote it, or, if not, how much lee way he had with the script. 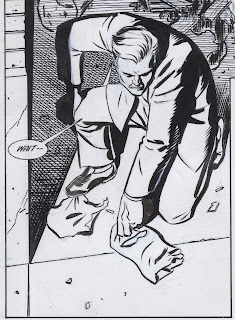 I also recall it was during this period that “The Death of Superman” was published, and how much it was loathed by my crowd, including Toth, who railed against it. My response was ambivalent. I could see it as a valid artistic challenge (tell an entire story just using splash pages); in fact this challenge is implicit in the revelation of “The Panel”: Could a gifted and foolhardily ambitious cartoonist tell an entire story this way? Of course, Dan Jurgens had never been able to story-tell his way out of a paper bag, so, of course, “The Death of Superman” was a God Awful Mess. Still, one had to give Jurgens points for hubris.